Arthur Rubinstein said: “I thank God for keeping me alive so that I would be able in hear with my own ears Sgouros play. He is the best pianist I have ever heard, including myself”. He then took off his gold watch and put it on Dimitris Sgouros wrist as if passing on the torch. Two months later he was dead. A young boy when he received such high praise from Rubinstein, Sgouros has since amazed audiences throughout the world with his prodigious talent. Highly acclaimed in the world of classical music, Sgouros has performed in major concert halls throughout the world including Sydney Opera House, Carnegie Hall, Royal Festival Hall London, Berlin Phil Hall, Herrodus Odeon in Athens, with some of the world’s best known conductors and orchestras, the Berlin Philarmonic, LLSO, LPO, Philarmonia Orchestra, B.B.C., E.C.O. and Oxford Symphony. Santa Cicilia Roma N.S.O. Madrid, Vienna Symphony, Dallas & Forhwarth Symphonies, the Washington National, Symphony, the Yomury Symphony Orchestra & the NHK of Japan, the Sydney Symphony Orchestra & the Melbourne Symphony of Australia and many others. Born in Athens, Greece in 1969, Dimitris Sgouros began his career as a student at the age of 8 years old, as a prodigy, at the Athens Conservatory, where by the time he completed his studies he had received every award given. He then continued his studies at the University of Maryland and the Royal Music Academy of London, exceptionally accepted there, from which he graduated with the highest mark ever granted by the Academy. Shortly, 1982, age of 12, Sgouros made his Carnegie Hall debut with the National Symphony Orchestra of Washington, D.C. under the direction of Mistlav Rostropovich, performing Rachmaninoff’s Piano Concerto No. 3! He has recorded 10 albums which are sold in many countries, with compositions for solo piano by Schumann, Brahms, Beethoven, Chopin, Liszt and Mozart and also Rachmaninoff’s Concerto No. 3 with the Berlin Philharmonic Orchestra, Tchaikovsky 1st Tchaikovsky’s Fantasia with the London Philharmonic and Liszt’s Concerto No. 2 with the Philharmonic Orchestra of Slovenia, to name a few as well as the 1st and 2nd J. Brahms Concertos with the Sofia Philharmonic Orchestra. In addition to being a world renowned pianist, Sgouros is a great combining both education and culture. He has been invited to give lectures at the University of Athens, the Togo Haguen University of Tokyo, Japan, Southern Methodist University in Dallas, Texas and the New Conservatory in Thessaloniki, Greece. He has been honoured with the International Leonardo Da Vinci award and Melvin Jones award and many other Greek and International great prizes. In 1988 a Festival was founded in his name in Lubljana, Slovenia. Since that time, Sgouros Festivals have been organized in both Hamburg and Singapore. Besides, he has been honoured with many other awards and prizes internationally. 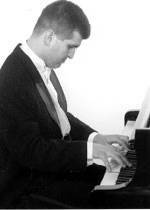 Dimitris Sgouros has been called a “musical phenomenon” and “the Greek Myth” has even been compared to Mozart. V. Svetlanov, the great Russian Conductor said: “Every one of us, would like to have a Sgouros near him”. In May 1995, was invited to perform at the St. James’s Palace (Buckingham Palace in a Gala evening recital for Royalties and VIPS). In September 1997 was invited to participate on the 850 years celebration of Moscow’s Russia and performed the 3rd piano concerto of S. Rachmaninoff. That was also the Russian debut with great success and the critic Nikita Michalov said : “We saw a great pianist to perform a concert of a great Russian composer, like to be also a Russian himself” and the Prabda wrote :”His performance, the manner of playing and his interpretation of the concert, were warmly accepted of Moscow’s public”. In 1998 he did his debut in Romania giving recitals and orchestra performances in all the main cities of that country, during two big tours (March and October) recorded by the TV channels almost all of his performances and all the Romania loved him! In march 1999, did his first tour in South Africa, performed solo and with orchestra performances with the National Symphony Orchestra of Johannesburg in Cape Town Durban - Pretoria and Johannesburg. In June 2000, Dimitris Sgouros was invited to make the opening-inauguration in the Ankara’s, Turkey, 4000 people capacity Bilkent odeon with the Bilkent Symphony Orchestra and Mo Gurer Aykal performed the S. Rachmaninoff 3rd piano concerto with tremendous success, as well. The critics, besides of the others said: “The 3rd concerto of S. Rachmaninoff, which is full of technical difficulties, only Sgouros, an ant of the piano could play this with such a sensitivity! In April 2000, after his new performance at the Carnegie Hall, recital debut, at that time he recorded a new Solo piano CD with works from his last recital with the R. Schumann Fantasie & J. Brahms piano sonata no.3, which is going to be realised from Elissium Quoliton by the end of 2000. After that, Dimitris Sgouros on his young age he still is visiting all the main countries and cities performing for many times again and again, since his 7 years old in all 5 continents of our earth.